There’s nothing worse than having dead batteries after a long week of wild camping. No matter how many batteries you have, eventually they will need to be charged. The two best ways to charge your batteries are through a solar powered battery or a portable generator. 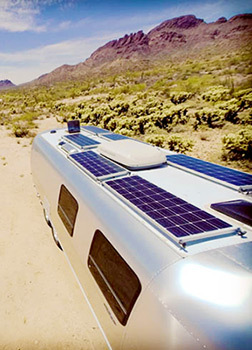 Solar energy for RVs are more popular than ever, they come in a variety of sizes and styles, and their prices have gone down significantly in the past few years. Whether you go all-in on a big solar kit mounted on the rooftop of your RV, or just with a small portable kit; solar power will allow you the freedom of fume free green energy and will also save you money in the long run. On the other hand, even with a solar set up, a backup generator is a must have. To be able to live off the grid for an extended period of time. Parking in the shades or cloudy days with no sun will leave you without generating any power. For this reason, investing in a good RV generator or a quiet portable generator is a great idea. 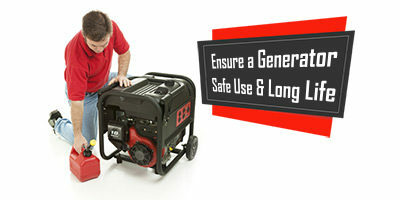 Make sure to measure the power of the equipment and appliances that you will be using before deciding on the size and type of the generator. 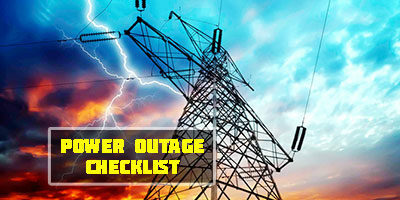 Keep in mind that conserving power when camping off the grid is essential. One of the easiest ways to save energy is by replacing all the lights in your RV to LED lights. LEDs are 90% more efficient compared to the traditional Halogen bulbs. In addition, they don’t produce heat and they live much longer than their traditional counterpart. While the initial purchase price of LEDs is a bit higher, however, they are more efficient which will make a huge difference in your power savings on the long run. In the hot summers, using an air conditioner constantly while boondocking is generally not possible. An AC uses a great deal of power. While you can run it off your generator, however, low energy fans are much better way to keep cool on a hot summer day. A great way is to mount them to your RV roof vents. Some RV owners choose to use temperature sensitive automatic vent fans, which automatically works when the temperature gets too high. You can set the desired temperature for the fan and it will vary the fan speed based on the inside temperature. Using a reflective bubble wrap on the windows will also provide some protection from the direct sunlight and from cold weather. In the winter and even during some summer nights temperatures can get very chilly, especially if you are camping in a high elevation area. The RV furnace is not fuel efficient, in addition, it can be too noisy for you, as well as any campers nearby. In this case, it’s best to have a backup heating source, such as a propane heater. A propane heater will save you a lot of battery power and is a lot more efficient when compared to using the RV’s big furnace heater. Don’t forget to properly vent your propane heater and never leave it unattended. Make sure to always read the user’s manual very carefully. Having a BBQ is a great thing to do while camping. But there is a great alternative to doing that in an environmentally friendly way. Instead of using your propane or electric oven and fill your RV with extra heat, using a solar oven for cooking is a great option. It can save you a lot of propane or electricity, especially when you’re camping in sunny climates. A solar oven concentrates the sun’s energy and directs them into the cooking area. There are ready solar ovens that you can purchase, and if you like building things, then you can build your own solar oven with a fraction of the price by watching some how-to videos on YouTube. We got to talk about conserving power, now let’s talk about conserving water in your RV. One of the easiest ways to do so is by using a water-saving faucet aerator. It limits the amount of water coming out of your faucets in addition to mixing it with a burst of air. Ultimately, you get better water pressure while saving your freshwater and also being environmentally friendly. You can install them in your kitchen and bathroom for effortless water saving. It allows you to reduce your water consumption by up to 50% than a traditional shower head or faucet. Furthermore, it will also allow you to use less energy from your water heater. To extend your dry camping stay we recommend getting a composting toilet. It’s a must have eco-friendly RV equipment. It uses no water and has no mess. Meaning you will not need your messy black tank anymore, just combine it with your grey tank, and increase grew water storage. Just make sure to measure your RV bathroom to confirm the toilet size before purchase. No matter how tidy you are, RV floors get dirty very quickly from accumulated dust, mud, sand, and not to mention any pet’s hair. Newer RVs often have central vacuums but they are usually far from efficient. A powerful handheld vacuum cleaner is an essential equipment to have in your RV, to keep everything clean and tidy. They are usually pretty small too and they won’t take much space in your RV. Rarely will you find a perfect level camping spot for your RV. Keeping leveling blocks and jacks can help even things out in order for your appliances to run properly. Make sure to choose high-quality materials for your blocks and jacks to help support your RV wheels. You may also need a bubble level tool so that you can easily check the ground level. You will always be traveling with valuables, and although it’s wise to bring this down to a minimum. Many anti-theft products for RV’s exist today such as alarms, hidden safes, deadbolt locks, kingpin locks, motion detector lights. To reduce the risk of losing valuable belongings during a break-in, you can consider making a secret compartment for your safe, assemble it in a way so it would appear like a fixed wall. You can get laptop sized digital safes as well, to keep your valuables safe. After all, securing your RV is really important and will give you some peace of mind. A tool box is a must have for any RV. A toolbox should include at least a multi-tool knife, screwdrivers, hammer, scissors, ropes, lighter, a strong duct tape and a flashlight. Also, consider bringing a repair kit for any other equipment that you carry along. Having a first aid kit is one of the most important camping essentials. Burns, scratches, cuts or bumps are bound to happen on a wild dry camping trip. You can purchase a ready pack or make your own. Don’t forget to include in the kit any personal medications and sun protection cream. Not to mention, to carry along an insect repellent spray or patch.